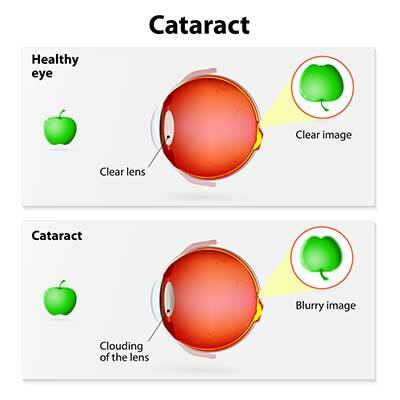 Cataracts are cloudy patches in the lens of the eye that can make vision blurred or misty. They are a very common eye condition. 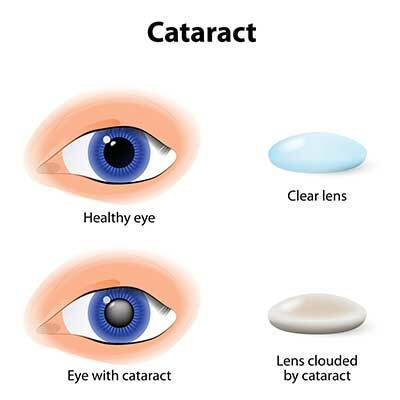 Cataracts can develop in one or both eyes, and one eye can often be more affected than the other. The lens is the transparent structure positioned near the front of the eye. It is originally clear and allows light to pass through to the back of the eye. However, if parts of the lens become cloudy (opaque), light is unable to pass through the cloudy patches as efficiently. Over time, the cloudy patches become bigger, and more of them develop. As less light is able to pass through the lens, a person’s vision is likely to become blurry or cloudy. The cloudier the lens becomes, the more the person’s sight will be affected. Less improvement from current spectacles. Cataracts are the main cause of impaired vision worldwide, particularly in developing countries. They affect men and women equally. Cataracts are more common in older people. Cataracts that affect older people are known as age-related cataracts. In the UK, more than half of people who are over 65 have some cataract development in one or both eyes. If cataracts are mild then stronger glasses and brighter reading lights may enable people to live with the condition. Once cataracts start interfering with daily activities such as cooking or getting dressed, surgery is usually recommended. It’s estimated that around 10 million cataract operations are performed around the world each year. Cataract operations are generally very successful, with a low risk of serious complications. ‘The most common risk is developing a condition called posterior capsule opacification (PCO), which causes cloudy vision to return but can easily be solved by having laser surgery to correct it.